At Bethel, health and wellness is about more than just physical fitness. It’s about a holistic approach to balanced living. With the completion of the new Wellness Center, the tools for healthy living are more convenient and accessible than ever. The additional 11,000 square feet of fitness area gives you a whole new experience for working out–with cutting-edge training equipment and studio spaces designed for group fitness. The 2 floors of exercise space offer students, employees, and alumni free access during hours of operation. Enjoy amazing views while running on treadmills near floor-to-ceiling windows. Move through a circuit-training workout or join a new group fitness class. 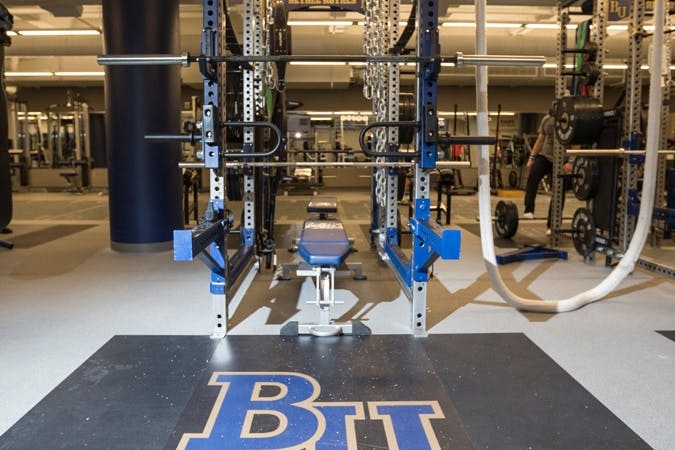 The Bethel University Wellness Center strives to provide innovative facilities and programming along with an uplifting atmosphere to encourage an active and healthy lifestyle while cultivating an inclusive and Christ-focused community of wellbeing. Monday-Thursday 6 a.m. - 11 p.m.
Demolition and medicine balls ranging from 3-25 lbs. Professional and student instructors offer a variety of group fitness classes that include yoga, Zumba, pilates, HIIT, sculpt, bootcamp and much more. Healthy living goes beyond the new Wellness Center, and many aspects contribute to a broader view of health. Bethel offers a variety of other ways to support well-being. The campus itself is equipped with running trails, a disc golf course, and plenty of sports clubs and seasonal activities. Even Bethel’s Dining Services provides healthy options for your meals. We also have on-campus services that nurture your physical, emotional, and spiritual health. Health Services is staffed by registered nurses and a physician to help when students aren’t feeling well or have urgent care needs. Trained counselors on campus offer support, encouragement, or guidance. And Campus Ministries pastors and staff are always ready to serve you as you seek to exercise your spiritual walk. Our vision is to become whole and holy people, and a holistic approach to health and wellness is part of that process. As you seek to develop academically, physically, and spiritually, come take part in all the services Bethel provides to help you reach your full potential.